ENTER THE SOURCE WALL! Without going to much into spoiler territory, if you’ve been reading Justice League since it relaunched last summer, or if you stared during the Dark Knight’s Metal saga then you’re going to want to read this annual. As always, remember to read your comic before reading this review. You have been warned. If you’ve read as many superhero comics as I have, it’s really hard to be astonished by some stories. 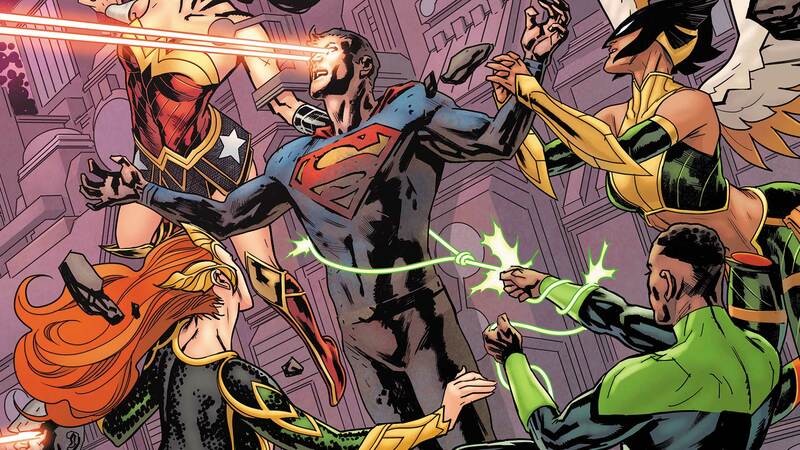 This Justice League Annual is not one of those examples. Superhero stories are all about seeing these larger than life figures tackle feats that us mere mortals can only vaguely understand. So when these larger than life heroes tackle something that is above their statue, it gives the story a huge unnerving feeling and it’s felt throughout the entire issue. I can’t help but feel that both Synder and Tynion drew inspiration from reading cosmic horror stories as they wrote this script. The slow buildup to the inevitable reveal of the monster waiting behind the source wall is a roller coaster of emotions. I didn’t know it was possible for my jaw to be dropped till I read this annual. What makes this Annual issue absolutely drop dropping is Daniel Sampere’s pencils. One of the hardest things to do in comics is capture a sense of scale and Sampere knocks it out of the park in this issue. His take on the fractured Source Wall is mesmerizing, perfectly capturing the small details within specific sections of the Source Wall and Sempere’s art doesn’t just stop here. This issue is filled with gorgeous splash pages of The Omega Titans and the new threat Perpetua, What’s even more astonishing is Sempere’s character work, I nearly cried my eyes out during the scene where J’onn created a special heaven for Kendra before her ultimate fate, and feels like a genuine depressing moment between two long friends thanks to Sempere’s art. Bottom line this annual is a artistic tour de force and fans who love DC comics on a gigantic scale don’t want to skimp out on this issue. It’s worth it for the art alone. The term grounded comes up a lot when discussing comics and some readers believe that it automatically means that everything fantastical will be stripped away from their favorite superheroes. Under the wrong writer that could be this, but grounded to me means keeping the characters feel real despite their insane settings. This issue is a prime example of good grounding, yes the Justice League are at the edge of the universe but that doesn’t remove their humanity and thankfully Tynion remembers that. The dialog feels organic when it needs to be, there’s a touch of camp whenever the Legion Of Doom takes over, but overall I love how Tynion handled the Justice League and Legion of Doom in this absolutely insane scenario.